Scientists in the United States have developed a new compound based on a chemical in the sweet wormwood plant. The new compound appears to be effective at killing certain kinds of cancer cells in laboratory tests. 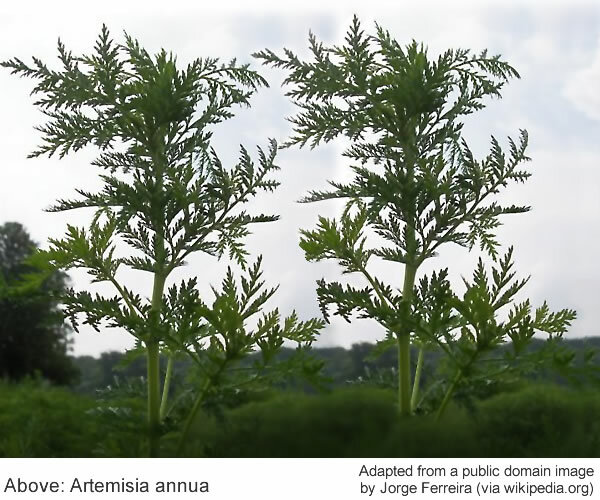 The plant, which is among various herbs used in salads in some Asian countries, is also the source of a common anti-malarial drug called artemisinin. Now, scientists at the University of Washington have modified the compound so that it targets cancer cells and is more than 1,200 times more specific in killing these cells than existing drugs. Detailing their research in the journal Cancer Letters, they explained that they attached a chemical homing device to the drug, enabling it to selectively target cancer cells but not healthy cells. The researchers tested the compound on human leukaemia cells and found it to be highly selective, killing 12,000 cancer cells for every healthy cell. Artemisinin itself kills around 100 cancer cells for every healthy cell, showing that the modified version of the drug is far more selective. This could help to reduce the side-effects associated with chemotherapy and could also enable much higher doses of the drug to be safely tolerated. "Side-effects are a major limitation to current chemotherapies. Some patients even die from them. The compound is like a special agent planting a bomb inside the cell." According to the researchers, the chemical tag that they added to artemisinin attaches to proteins on the outside of cells which are designed to attract iron. Cancer cells need particularly high iron levels for tumour growth so they tend to have large numbers of these proteins on their cell surfaces. However, instead of only swallowing up iron, the affected cancer cell also swallows up the artemisinin attached to its surface, enabling the drug to enter the cell where it reacts with iron to release poisonous free radical molecules that destroy the cell.
" The compound is like a little bomb-carrying monkey riding on the back of a Trojan horse. _ Most currently available drugs are targeted to specific cancers. This compound works on a general property of cancer cells - their high iron content." Although human trials are still a number of years away, the researchers believe that their compound could eventually provide a relatively cheap cancer treatment. The above news has been provided by Adfero in collaboration with Cancer Research UK. News is included to provide information about current issues but not to endorse any particular view, activity or product. Any opinions expressed in this article are not necessarily those of IvyRose Ltd.. At least some of the material on this page was released by the source/s indicated below on or about 16th October 2008.This article has been prepared by IvyRose using information and quotations that may also be from various other sources as well as any further comments, explanations and images credited individually.